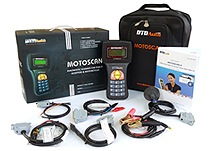 WHAT IS NEW IN MOTOSCAN 6.2 RELEASED 14/02/2019? WHAT IS NEW IN MOTOBOX 1.6? - JALTEST is a specialized diagnostic tool for diagnosing vehicles using diesel fuel and diesel engines such as construction vehicles, tractors, agricultural vehicles, marine engines, canoes, heavy trucks, light trucks, passenger cars in Asia, European and American markets. This is integrated diagnostic equipment in the professional segment of high quality. - The product use computer application software solution (PC-based) and incorporates a signal converter to connect ECUs on the vehicles. - FIO 2 – The abbreviation of an electronic accessory will be adding on the new generation motorcycle and car that used Programmed Fuel Injection technology (PGM-FI). It allow user calibarate optimally fuel injection system to standard value of engine. - FIO 2 is researched and manufactured by DTDAuto Technology Team, Institute of Physics, Vietnam Academy of Science and Technology.